Using your PMF content on a mobile device is simple. Any PMF dashboard or other PMF-managed content can be turned into a WebFOCUS Mobile Favorite by clicking the Add to Mobile Favorites icon on the Today tab ribbon. You will receive a confirmation page that the content has been added to your Mobile Favorites. You can navigate through any mobile dashboard using standard mobile device gestures on any iOS or Android™ device. Using the magnifying glass on the dashboard will zoom in on gadgets, allowing you to see enhanced detail and more easily interact with the gadget. Swiping the screen will allow you to navigate from gadget to gadget. Note: Gadgets allow operation in the following browsers: Safari®, Android, Firefox®, and Google Chrome™. Microsoft Internet Explorer is not currently supported. The Ginsu slicer allows you to use swiping and tapping gestures to set up dashboard parameters on any mobile device by touch. It can also be used if you are running Chrome, Firefox, or Safari from a PC. If using a mobile device, drag your finger up from the bottom of the window to open the slicer. If using a PC browser, click the slicer to open it. The slicer opens, as shown in the following image. On tablet-type devices, the PMF dashboard locks and zoom is not available during Broadcast. You can tap on chart and grid components to broadcast changes of a dimensional drill or object to the overall dashboard, without zooming. 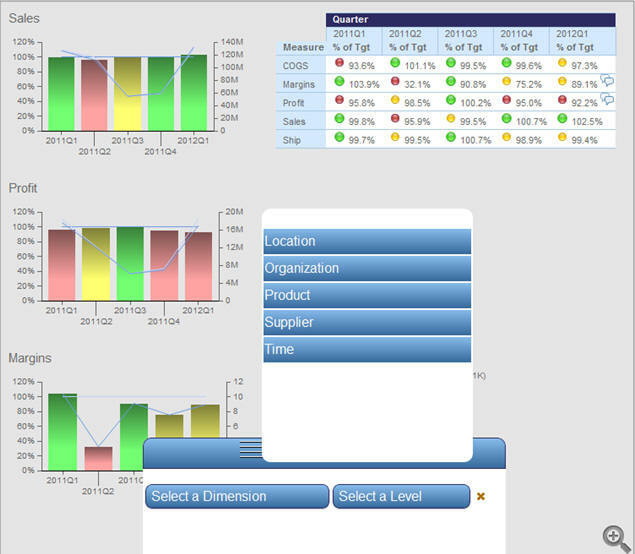 Zoom is implemented using a separate button located on the bottom right of the dashboard. Tapping the Zoom button zooms the top-left gadget on the Dashboard to full-screen, and you can swipe between the different gadgets from Zoom view.